For over twenty years a small group of dedicated volunteers has been committed to the mission of bringing high school sports coverage to Fairfax County. • 1986: Brian Hopkins and Wes Carr started High School Sports as a weekly public access program and for five years brought Fairfax County the football and basketball Game of the Week. • 1991: Brian Nern took over and re-named the show Channel 10 Sports. In addition to basketball in the winter, they began coverage of a few wrestling tournaments. • 1992: A spring schedule was added covering soccer, lacrosse, and baseball. • 2003: The group name was changed to Fairfax Sports Network, covering as many as 22 different teams per season. Fairfax Sports Network has provided coverage of special events such as the Northern Region Classic Wrestling Tournament, the Pohanka-Chantilly Holiday Basketball Tournament, and Bulldog Bash Holiday Tournament. We’ve also covered the Northern Region Championships for both Cheerleading and Swimming. In October 2003 FSN acquired a used vehicle from Centreville Volunteer Fire Department, Station 17 to build their first production vehicle. Through a grant from Ted Britt Ford, Fairfax Sports Network was able to purchase the vehicle and outfit it with basic gear to produce the VA State Football Championship game where Westfield High School defeated Landstown. In May 2004 Fairfax Sports Network added rowing to their growing list of sports covered, producing a DVD of the 2004 Virginia Scholastic Rowing Championships. 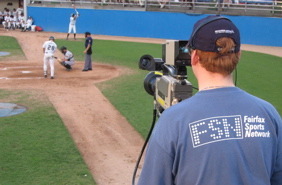 During the summers of 2004 and 2005 Fairfax Sports Network covered Potomac Cannons home games at Pfitzner Stadium in Woodbridge. The games were aired in Fairfax County, Woodbridge, and Manassas. 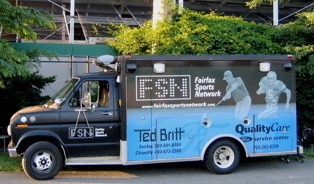 In fall 2004 Fairfax Sports Network further enhanced the production truck with both improved and new equipment including digital slo-motion replays and improved field reports. In addition to full game coverage, we bring big local names into the studio to provide commentary and in-depth analysis each week. For several years Mark Bendorf from Robinson Secondary and Pete Bendorf from South County High gave the inside story each football season with their popular program THE BENDORF BENCH. Sports reporters from various regional papers give weekly news and scores throughout the year on THE FAIRFAX SPORTS REPORT. Along with the major sports in the area the Sports Report covers many smaller sports also like field hockey, power lifting, cheerleading, ice hockey, volleyball, and softball.Fairfax Sports Network has added two additional trucks to cover multiple games each week.We’ve produced regional high school games in VA, DC, MD, and NJ that have aired locally on Verizon FiOS, Cox Communications, Comcast. We’ve also produced NCAA & NASCAR events which aired nationally on Verizon FiOS and CBS College.